'In November (1897) Swami Vivekananda visited Lahore along with his disciples. He was put up in the Haveli of Raja Dhyan Singh at Hira-mandi, where Jagadguru Shankaracharya also had been put up earlier. Goswamiji (Tirtha Ram) and his students had arranged for his lectures also in the same place. There was lot of open space there, even then it used to be so crowded that it was not possible to accommodate all the people. By sheer luck, Prof. Bose's Circus had come to Lahore then. As there was no alternative, Swamiji's lecture had to be arranged in the Circus pandal itself. Goswamiji listened to his lectures with great interest and enthusiasm and inspired others also to listen to him. 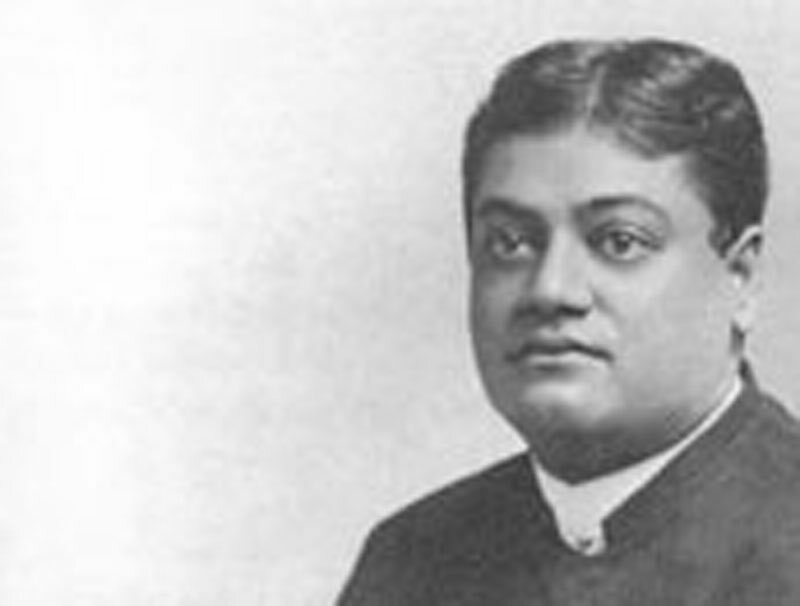 He became so intimate with Swami Vivekanandaji that he even brought him at his residence for dinner. . . His western disciples also dined there itself. After taking his meals, before parting, Swamiji looked into the personal library of Goswamiji and picked up a book, too. It is in the blood of the Punjabies in general that they serve any guest or holy man to the best of their might and try to gift him the dearest of the things. Therefore Goswamiji offered him his most valuable belonging, a golden watch, but Swamiji, putting it back into Goswamiji's pocket said that he would use it from his person itself. Although Swami Vivekananda was a famous Vedantin and a monk of very high order, he never gave up recitation of Chandi. He used to recite it with great fervour. I have seen him reciting it. Lala Hukumat Rai was a devotee especially attached to Goswamiji. It was he who arranged the lectures according to instructions of Goswamiji. He also used to visit Swami Vivekananda along with Goswamiji. The author, Goswami Brij Lal, a nephew of Goswami Tirtha Ram (later Swami Rama Tirtha), was also staying there with him. He later wrote a biography of his uncle (Swami Ramatirtha) in Urdu (published from Lahore , 1912. At the time Goswami Tirtha Ram was a mathematics professor in a college there in Lahore, and later inspired by Vivekananda became a monk. Above is an excerpt on Swamiji from that book (pp. 115-118). (Swami Videhatmananda, editor, Vivek Jyoti, a Hindi monthly of the Ramakrishna Order published from the Raipur Centre provides this information for Vedanta Kesari).